I need help creating a design for a t-shirt which already has a set logo which has been created. These shirts will be sold at a national llama show and reflect the show name and logo - the show's name is March Llama Madness and the logo was designed with the March Madness Basketball theme..which is why the colors are navy, orange, and white, and why there are the lines on a basketball behind the llamas. I need the design to incorporate this already designed logo (which includes the basketball lines, the two llamas and the "MLM" below the llamas) with new graphics and text around it. 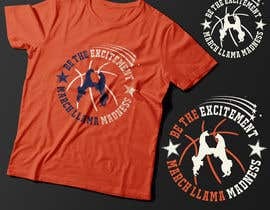 We are trying to create the idea of "excitement" and have added the text "Be The Excitement" which should be placed above the logo. We also want to add some sort of graphics...stars, shooting stars, fireworks, or some other graphics..to convey the "excitement" theme. 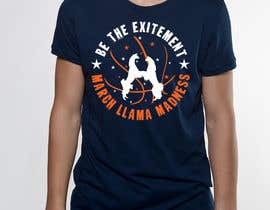 The current logo design is done in the colors of navy blue, orange and white. We need to try to stay with those colors in some way..but are having difficulty finding a t-shirt color that will work with the current logo color scheme If the shirt is dark, the llamas get lost. If the shirt is light, the white gets lost. 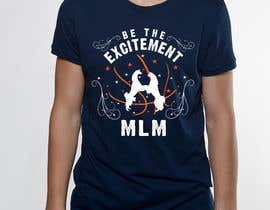 I have attached pictures of the basic logo ( 2 pictures- one is missing the "MLM" at the bottom..and one of a t-shirt made last year with the complete logo), along with a few ideas that have been presented that just are not quite right. I would really like to do a navy blue shirt for this project...so the color of the llamas would have to change. (probably to white or light grey). I have attached two pictures that show the already created logo ..although the first picture is missing the "MLM" at the bottom..but you can see that in the second picture of the grey t-shirt. I have also attached 3 ideas that have been submitted, but that just aren't working. They are either too feminine, or too birthday party with confetti-ish or too plain. And, I have attached photos of two navy blue shirts that use the colors white or grey, and orange that I like the look of. These shirts need to appeal to both men and women. 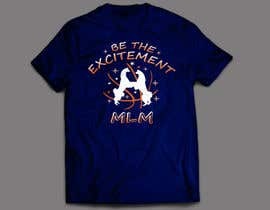 I need a print on t-shirt ready design.